The bat handle, for not more than 18 inches from its end, may be covered or treated with any material or substance to improve the grip. Any such material or substance that extends past the 18- inch limitation shall cause the bat to be removed from the game. 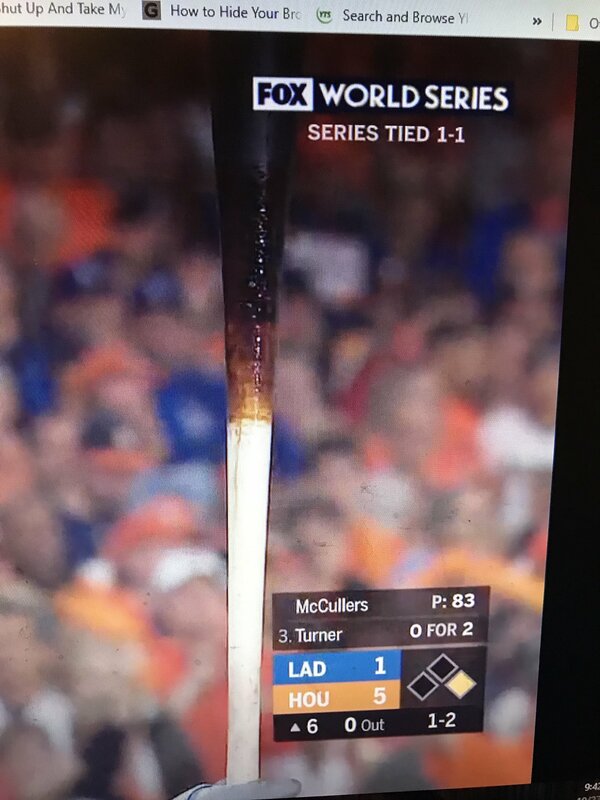 Now, during tonight's World Series game, LA Dodgers player Turner was using the bat below. Clearly, you can see a shiny substance on the bat, which looks consistent with pine tar. Would this not be an illegal bat according to the rules? Browse other questions tagged rules baseball equipment or ask your own question. Cricket bat with bent handle? What is this swiveling hook supplied with snowbard bindings for? What is the legal size of cricket bat? Who autographed this bat from San Diego Padre?